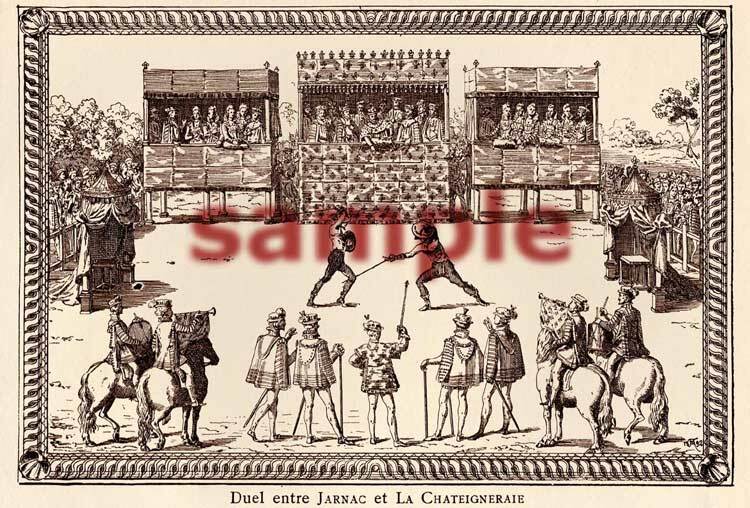 his formal combat between Guy Chabot Comte de Jarnac (Jarnac) and Francois de Vivonne Seigneur de Chateigneraie (La Chateigneraie) who were both kinsmen and neighbors resulted from an accusation that Jarnac was being “kept” by his father’s second wife. Chateigneraie held to the position that Jarnac told him that he had a liaison with his stepmother. Jarnac, upon hearing of this accusation, gave Chateigneraie “the lie,” meaning that Chateigneraie was a liar. Jarnac demanded that his honor be restored and Chateigneraie accepted the challenge, requesting a “field” from the King. Francis I at first granted the request only to afterwards withdraw it. Upon the death of Francis I, Chateigneriae petitioned King Henri II for a field and Henri II granted the request. The sovereign decided that the combat would take place in thirty days, both gentlemen having a month in which to prepare for the ordeal. La Chateigneriae was an experienced warrior and was renowned as a man at arms. On the other hand Jarnac was ten years younger and inexperienced. He therefore enlisted the services of an Italian fencing master. On the appointed day after all of the formalities and ceremony were completed, the men entered the field. Upon the signal to commence, they quickly advanced and met each other, giving and receiving many blows and several inconsequential wounds. Jarnac, adhering to his fencing-master's teachings, executed a high feint at Chateigneraie’s head. As Chateigneraie raised his buckler to defend, Jarnac passed his blade under the defending shield and gave a cut to the ham of Chateigneraie’s left leg behind the knee. Jarnac pursued the attack and followed with an immediate cut to the ham of the right leg. From that moment this technique became known as the coup de Jarnac. Chatiegneraie fell but vainly attempted to continue the combat only to be disarmed. Jarnac, not wishing to take advantage and desiring not to kill his adversary, pleaded with King Henri II several times for a decision. However, the King did not utter a word. After repeated pleading the king was advised to have Chateigneraie’s wounds attended to but Chateigneraie feeling utterly disgraced, refuses treatment and died from the loss of blood.